FOLLOWING INFORMATIONS FROM: http://www.wapahani.com/addensmg5.html Introduced in 1985, the Type 77A1 was created by emulating the Ingram series of SMGS as well as the Israeli Mini Uzi pattern. 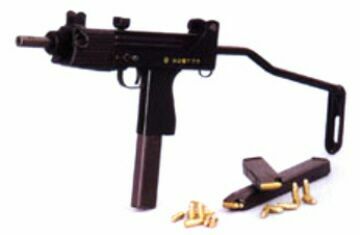 A conventional 9mm submachinegun, it was intended to be used by specialist troops within the Taiwanese military. It uses a conventional wire stock which allows it to be stabilized for longer ranged shots. However the weapon is intended for close quarters combat. As such there are small quantities of the weapon available, these are exclusively used amongst the elite units of the armed forces of Taiwan. The T77A1 fires the 9x19-Parabellum cartridge feeding from a 30 or 32-rounds magazine.